Feng Shui is an ancient Chinese school of thought, that is based on the philosophy of harmonising the surroundings with the people living or working in it. The aim is to arrange the environment to facilitate a favourable flow of energy called Qi in Feng Shui terminology. By following the guidance of Feng Shui, from rules on how and where to place different types of furniture to choosing the right colors for different rooms, home owners can create positive living spaces for everyone in the family. Of particular interest to new homeowners is the Feng Shui setup of the bedroom. Afterall, at the end of a hard day’s work, we look forward to rest our tired bodies in a cozy and refreshing space that promotes sleep, peace and harmony. The most important object in the bedroom is of course the bed. This key piece of furniture is the first thing you’ll want to make sure it’s positioned correctly. Feng shui experts tell us that in every bedroom, there is an ideal position where the bed should be placed. This spot, called the commanding position, is the best position to place your bed for good quality sleep. The commanding position is typically found diagonally from the door, where the bed’s headboard is positioned against the wall that is across the room from where the door is. In other words, you should be able to see the full view of the door from the bed, but not directly in front of it. This bed placement is called the commanding position because it puts you in command of the entire room where you can see anyone who is entering your room, and not getting caught unaware. This sense of control promotes restfulness and quality sleep. The second important rule is that the bed should not be placed directly under a window, or placed in the path between the windows and door to avoid getting in the way of the flow of energy to and fro the door and windows. The reason is because the constant movement of Qi can disrupt your rest if you’re sleeping in the path of its flow. Other than the position and orientation of the bed, the next key Feng Shui consideration for the bedroom is the wall colours. Colours can significantly influence the mood of the bedroom and the state of mind of people resting in it. The aim here with colours is to create a right balance of yin and yang Qi. The right colour balance is neither too bright nor too dark and reflects the personality of the bedroom owner(s) as far as possible. Overly bright colours like neon has the effect of constantly stimulating the eyes and mind, making it hard to go into a restful state. The same logic can be said of busy wallpaper designs or wall art patterns. The best colours for a comfortable bedroom are soft colours like pastel greens, blues or pinks – colours that create a calming and soothing atmosphere. These soothing colours are especially good for children’s bedrooms where an active child winds down and rest. 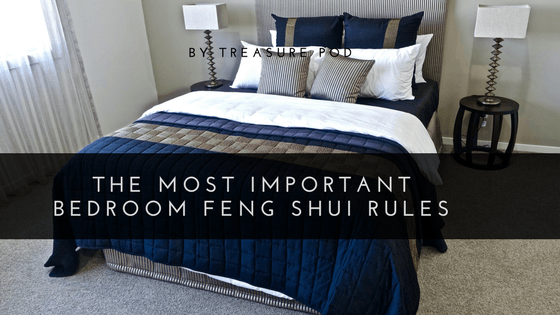 For more Feng Shui tips for your new home, you may wish to consider engaging a Feng Shui master for some personalised advice which can only to determined with a site visit. All the best in creating the perfect Feng Shui home!